I particularly liked how each square had the colour required within it – especially the ‘folded’ yellow – and that we weren’t spoon-fed their existence in the Preamble. Last (at the time of writing) Saturday 29th July I was delighted to meet up with fellow setters and solvers at the regular, quarterly, Listener get-together in London. Before the meeting and after a relaxing breakfast with one of my sons, he and I decided to visit Tate Modern. So imagine my delight when I saw L4462 this weekend! I am definitely counting myself very lucky that it appeared before I’d invested too much time in creating my own imitation. Have any other setters experienced similar? * I.e. been a (long?) way down the track with a new puzzle theme only to find someone else got there first? Perhaps it is a lot more common than I realise? If yes, I’d love to hear your Comments! *Of course fellow blogger Dave Henning’s database does a great job of helping one avoid inadvertently using a previously deployed theme, or ensuring that a new use is different enough: it’s the time where new themes are hiding in the puzzle editor’s queues where the ‘fun’ starts! The preamble was rather daunting – a grid with no clue numbers, no word lengths and the clues divided into sets of three ‘squares’ and others. 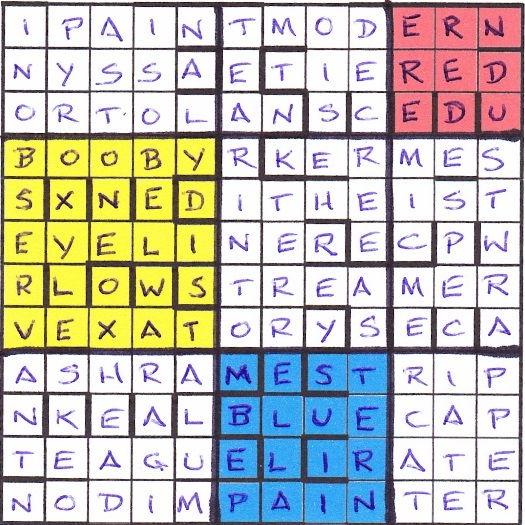 There were two anagrams to discover and solve too, though we suspected at once, since those were both of three words, that they were going to be on the top and bottom rows of the grid or down the two sides. Of course I had to check that Phi had maintained his long-standing right of entry to the Listener setters’ toping outfit, and, of course, though rather eccentrically, he confirmed it with an obscure East African drink, ‘Millet supplied by West Africa for East African drink.’ I confess that I needed Mrs Bradford to produce a drink with WA in it, and, of course, RAGI is millet, so hope to see you at the bar in Paris, Phi, maybe with something slightly less exotic than WARAGI. Cheers! We were really lucky in that we spotted the hidden ORTOLAN at once, ‘Some decor to landscape is bunting’, and it was evident, since the ‘other’ clues were in conventional grid order, that that was going to fill the first across light of seven cells, so our grid fill was immediately underway. Since that was one of the clues that was not in any of the squares, our ‘yellow’ square quickly filled. As soon as we realized that a word like DITHEIST, ‘Scots block robbery, one directed by two overlords’ (DIT + HEIST – what lovely word play!) was in that square even if only one letter of it fitted there, we were well underway. Even better. I PAI?T appeared on our top row and we had our penny-drop-moment. Who paints squares? Google at once confirmed that MONDRIAN’S first name was PIET so I PAINT MODERN seemed likely and the slightly less likely NO DIM PAINTER went across the bottom of our grid. I was lucky in that I had selected red, yellow and blue as my working colours, with those ‘other’ solutions in green and the dimensions of those squares were fixed since black lines, in Mondrian style, had to divide them. We soon spotted that the names of the colours were actually appearing in the squares, and we were home and dry. Most enjoyable, thank you, Phi. Hares? Of course they were there, rather deceptively jumbled and not in straight lines but squatting merrily in the Mondrian masterpiece. There were a couple of DOEs too at the top and bottom of the grid but the hares had clearly not spotted them yet or there would have been some lively sport, I suspect. Phi’s 2017 Listener puzzle faced us this week. You never know with him whether it’s going to be relatively easy, tricky or an outright toughie. My blog for last year’s A Bit Up in the Air (about the tossing of a coin) began “A much easier week from Phi”. Would this week’s be equally forgiving? I tossed a coin: it came down heads. Here we had four sets of clues. Three were presented in alphabetical order of their answers, each relating to a square region of the grid. The fourth set of clues were in normal grid order and I decided to tackle them first. The second clue in this group led to ORTOLAN and the third to KERMES. I took a chance and entered them in rows 3 and 4 respectively. OISE came next, but there were no 4-letter across entries so it looked as though that would go in the top right corner. MERCAT and ALUM were the only others I got in this group and, again, I took a guess that they were in the bottom half of the grid. The clues under the ‘square’ headings were a bit slow coming, but I was happy when I got INOBSERVANT going down column 1 — the V almost certainly precluded it from column 12 (OLLAV seemed unlikely). The rest of the grid still took some time, especially since the top and bottom rows turned out to be the unclued entries. These two rows turned out to be I PAINT MODERN and NO DIM PAINTER (rather than “Nod, I’m painter!”). It didn’t take too long to unscramble Dutch artist Piet Mondrian (1872–1944), he of the squares, rectangles and black lines. The Wiki article describes his later works as “almost cartographical in appearance”, which I guess could be called MAP RENDITION. All that remained was to paint each of the regions as indicated by their hidden colours — RED, YELLOW, BLUE — and then draw in the thick black lines. Et voilà! Although it certainly AIN’T MIRO PEN’D. Another enjoyable work of art from Phi, thanks. I’d pitch it about medium difficulty, unlike some of Mondrian’s works which remind me of what I drew as a kid! Now where’s my easel? I like puzzles where a simple shape has to be highlighted; for example many years ago a Listener crossword displayed the copyright symbol. In early August 2015 it occurred to me that a question mark would make a nice image in a 13×13 grid, which led to “To be or not to be …”. If the seventh word is omitted (apologies to all purists), the beginning of the quote would fit inside the question mark. The grid would need about 45 clues and fortunately, as the “location” was 22 letters long, a concealed message could fit neatly into the across clues. I had recently started using Qxw for constructing grids, and with relatively little thematic material it was easy to produce an acceptable grid. A day to write the clues, think of a title and, hey presto, all done! I was surprised that this theme had not been used before. A lovely short preamble (yes, I know that can be the precursor to a dastardly crossword but fortunately, this was not the case). We at once speculated – “What was the location of the Gettysburg address?” Well, Gettysburg, probably. “Where did Churchill make his ‘blood, sweat and tears’ speech?”, “… Chamberlain’s ‘Peace in our time’ was on some aerodrome runway wasn’t it?” The possibilities are endless. It was a rather misleading preamble; as usual nothing to do but start solving. So we did. Of course I scanned the clues to check Aedites’ right to his Listener Setters’ Alcohol Promoters membership card and drinks were rather restrained but one of the earliest clues we solved produced an EWER, ‘Less without front container for liquids (4)’ FEWER minus the F, and the very next clue we solved produced the ‘red’ to fill it; ‘Red cover disrupted levees (6)’. LEVEES* gave us SLEEVE and we had found a misprint since that had to be a ‘rod’ cover. Clearly that red was being imbibed in quantities as the next misprint we discovered came from another decapitated word ‘Fight thwarted without force (5)’ which must be FOILED without the F telling us that now he was OILED with a misprint giving TIGHT So cheers, Aedites. Membership confirmed. Hope we’ll see you at the bar in Paris. Solving was speedy and we admired the economy of the compilation. When I once said that a personal maximum number of words in a clue was twelve, I earned a horrified reaction from an editor who said he aims at an average of six. Some difficult words oblige a setter to use eight or ten, and a device, like misprints, can add length but Aedites had three and four-word clues to give a fine balance: ‘Territory for stags (5)’ gave us STAGE producing the E corrected misprint and STATE (Surely definition was rather too close to solution? Ed.). ‘Safe to keep dog in sight (6)’ giving SEE round CUR – what a lovely surface reading. Last week I spent about seven hours finding Sabre’s bees so I appreciated a relatively gentle solve this week. HAMLET quickly emerged at the head of the message produced by the corrected misprints. I love the play having spent my last year of uni studies focusing on it, and it was clearly going to be ACT THREE SCENE ONE that was going to produce a large question mark and ‘To be or not to be, that is the question’ with a word missing – and there it was. We had just one Numpty red herring; ‘Apparently raise temperature in dressed spud (7)’ had mystified us (and I still don’t understand the wordplay) but we had opted for CURRIED on the basis that a SPAD can be a horse and dressing a horse is ‘currying’ it. No, it had to be SPED! HARES. Obviously a Lewis Carroll-style white-rabbitty HARE had just sped off the lower left hand corner decapitated (by the grid margin), like those Aedites clues, but there were a couple in a typical hare boxing match up there in the centre of the question mark (possibly somewhat existentially challenged beasts). Good fun, thanks, Aedites.